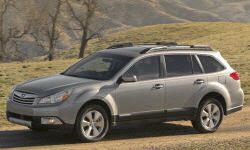 Subaru Outback Pros and Cons | Page 1 of 4 | Why Not This Car? What drives people to buy (or not buy) a certain car? TrueDelta's members share Subaru Outback pros and cons based on their real-world driving experiences. Sign in or join TrueDelta to post your own "whys" and "why nots." I still do, but not as much. For 0 to 35 in town, and cruising at highway speeds this vehicle does spendid. Merging on the freeway takes some enthusiam on the part of the driver. I wll upgrade to the turbo when the time come. This is an excellent car overall, but the audio system is poorly designed and frustrating to use. Sedans too small? SUVs too big? Outback is just right! I am not sure why this car has a frown for reliability because I have had nothing but a great experience with this car. Very happy with the 2014 OB! Had a 2010 Forester with the 2.5 4cyl and auto. Hated it. Test drove the Outback with the 3.6R 6cyl and 5 spd auto. Love it! Great power and the transmission is so smooth. Just wish I could shift gears from the gear selector and didn&#039;t have to use paddles. ...just know that it's a wagon and an SUV with a few compromises. Great handling compared to an SUV, great handling, great fuel economy and great value. Just realize it's an "almost luxury" kind of ride at this price point (in 2.5i Limited trim). Good vehicle, but you'll pay for it at the pump. Lived up to reputation, one year 20,000 miles no repairs. The Outback has great seating and plenty of room for 4 adults. Nice visibility for a crossover. Long trips are without fatigue. I would like a drivers seat memory function. I heard 2013 will have one. Heated leather seats are awesome. I love the electric seat adjustments. Spacious and quiet. Plenty of room for the dog in his "boudoir" in the back. Plenty of USB, 12V and 120V connections. See TrueDelta's information for all Sedans and Wagons. See TrueDelta's information for all Subaru models.